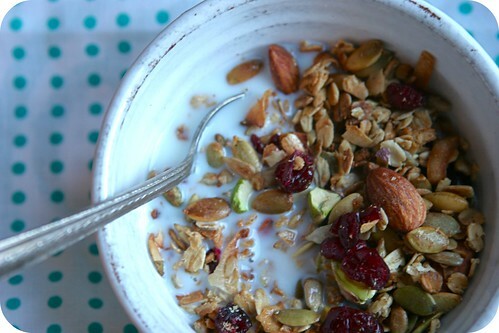 The last time I posted about breakfast cereal, I was dissing granola in favor of muesli. I'm back in the granola camp these days. Sometimes, on a rainy weekend like this one, things just don't seem right without a batch of granola in the oven. The kids walk by the cooling pan all afternoon and sneak bits. I act like I don't see. Things are made particularly cozy by the fact that I am officially listening to Christmas music. I make myself wait until November 1st. I am the World's Biggest Toasted-Oat-Eating Sap. This recipe uses butter--you can sub vegetable oil if you want, and you can use as little as 3 or 4 Tb. of it. The less fat you put, the more closely you should watch to make sure it doesn't burn. I put the pistachios in after it's toasted to preserve their bright green color. Mix oats, seeds, coconut, and almonds and salt together in a large bowl. In a saucepan over medium heat, melt butter with brown sugar and maple syrup. Stir to combine, pour over oat mixture, and mix thoroughly. Divide evenly between two pans and toast for 20-30 minutes, switching pans halfway through. Remove from oven and let cool. Add cranberries and pistachios and store in an airtight container.